I was first introduced to Brian Selznick through The Invention of Hugo Cabret. My thoughts on that book were that, while the text of the story didn’t really connect with me, the concept of the book using so many pictures and photos entwined with the story was really awesome. I also really liked how the book was all about old film, so overall it was an enjoyable read for me. 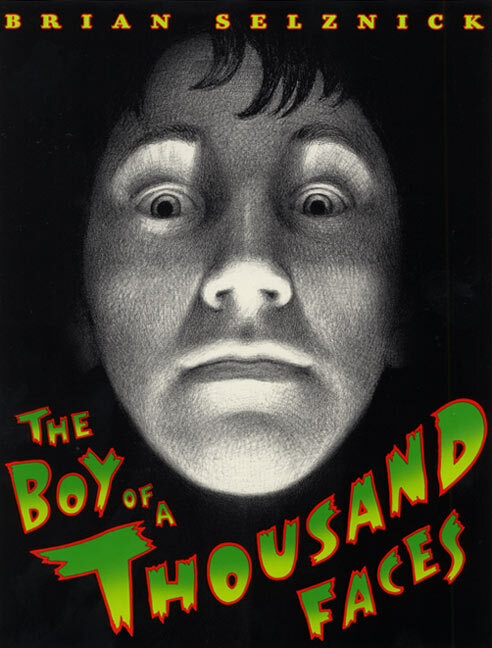 When I heard about The Boy of a Thousand Faces, I was immediately intrigued. As I’m sure you know, I love movies, and horror movies are my favourite. So to read a whole book about old horror movies? I had to read it! The story is about Alonzo King, a boy who loves old horror movies and monsters. His favourite movie is The Phantom of the Opera, and his dream is to be like Lon Chaney (the man of a thousand faces) by being the boy of a thousand faces. Unexpectedly, he gets his wish when a mysterious beast is spotted around town, and Alonzo discovers that the beast is actually him! This is a really short book…it took me less than fifteen minutes to read it. However, it is awesome. As an introduction to Selznick’s style of storytelling, it is great, because it combines his artwork with real images, including pictures of certain real-life horror stars like Lon Chaney as The Phantom. It is also wonderful as an introduction to old horror movies. I read this, and now I want to kick back and enjoy some classic horror! So, pretty much, I loved this book. For kids that like horror or film or history or spooky tales, this is a great way to show them a little glimpse of the world of classic horror cinema. In my opinion, getting kids interested in old films is fantastic. And when it’s done through a book, it’s even better! I would definitely recommend this to kids or teens (or anyone) looking for a nice, quick read that gets them in a spooky mood, particularly if they appreciate the history of horror and film.